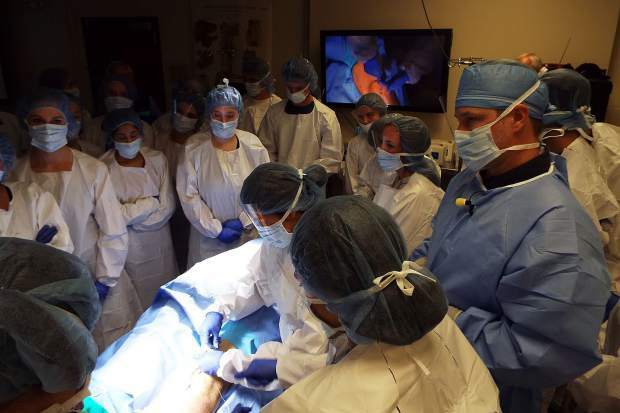 Surgeon Andrew Ringnes gave every student an opportunity to help hands-on with the procedure. Fingers gloved in blue latex fidgeted with each other as the student stood at the back of the group, her eyes peering through clear plastic between surgical mask and elastic hair net. She looked at her feet, over to classmates around her, everywhere but the two large screens or the surgeon a dozen feet away slicing and peeling apart a cadaver’s knee. The patella hung in meat flopped over to a side, and the twin knuckled end of the tibia gleamed bright among a mass of gore, though bloodless. Just minutes before, lightly tanned skin ran smooth over the length of a well-formed older woman’s leg, healthy with exercise and ready for more. After a nap, maybe. Well, other than the leg alone projected out of blue medical wrap. Where a head otherwise would be was covered, no longer any need to make room for it. She, whoever she was in life, was the hero in this theater. Maybe the donation of her earthly remains would inspire one or more of the 60 high school seniors from Truckee, North Tahoe and Incline to choose medicine for a career. It’s quite a selfless gift. Three or four teenage girls took in everything, missing no detail, as they leaned in within a hand’s reach of the surgeon, so intent, so … clinical in their curiosity. They stood out among a small sea of students in identical garb looking on with various degrees of fascination, here and there some horror creeping in. But that’s a great lesson, too: What you think in the abstract you might like for a career until you see it in the flesh, up close. Before he started, Dr. Andrew Ringnes talked about what to do if feeling woozy. It happens. I didn’t pay much attention. Something about bending over, or sitting, and a joke about being closer to the floor in case you faint. Might save on injury, shorter fall and all that. “Are you ready for this?” my nurse wife had asked early that morning as I dashed out for the drive to the University of Nevada, Reno’s medical school. “OK,” she said, still in bed, sleepy, in a tone suggesting maybe I hadn’t thought this quite all the way through. Oh, this is good, I thought, as the surgery began. The squeamish girl brought her hands together, shifted her weight and avoided even glimpses at the action. Terrible, but my job, to observe. I surreptitiously focused on her, taking notes. The fingers twiddling, the dread in her eye. “You OK?” a responsible adult called out. She nodded, said she was fine, trying to sound sure, being brave. Other students asked questions I couldn’t quite hear. Ringnes answered as he worked, noting differences in texture under his blade between live bodies and cadavers. He talked about the lack of blood in this case, how surgeons deal with bleeding during live surgery. He mentioned a knife that also cauterizes as it cuts. Cool. Yesterday, he’d done a couple of knee replacements much like the one he was demonstrating for the students, along with two hip replacements and a shoulder procedure. He gets lots of practice at Tahoe Forest Hospital in Truckee, of course, a mountain town with all the mountain pursuits as well as more people reaching a certain age when joints wear out and arthritis takes hold. He earned his undergraduate degree in San Diego, then went to medical school at Tulane, a residency near Detroit, another more specialized fellowship at Stanford. He had a journey of 14 years or so to today, finding himself a busy orthopedic surgeon. Not bad for a country boy from Walker, a tiny town in Nevada south of Topaz Lake. Could have been cars, but an orthopedics’ tools are so much cooler — more, ahem, cutting edge. I bumbled afterward into a handful of students. Of course they all found the experience spectacular. Inspire you to want to become a doctor? One said she always knew she wanted to be one, and this didn’t dissuade her. She’ll start on the quest at Berkeley next fall. Didn’t think surgery was in the cards, though. Tahoe Forest, Tahoe Truckee School District and the University of Nevada, Reno, School of Medicine have teamed up on this field trip for the past several years. One of Tahoe Forest CEO Harry Weis’s top passions is getting local kids interested in medicine as a career — and then coming home to practice. The early feedback has been promising. As I studied the squeamish student, interested in this phenomenon and why it isn’t at all uncommon, well, the earth moved under my feet. Whoa, what was that? I looked at the screen, the knee rendered an exploded mess to my untrained eye, and then back to the girl. She was handling this much, much better than me. I found myself in the bathroom, dizzy, nauseous, feeling like, well, you know. My shirt was soaked as if I’d hiked Squaw on a hot summer afternoon. Seems the life lessons don’t stop with the kids. Let’s just say I’ll decline any invitation to watch the next surgery on my knee. Knock me out, please.